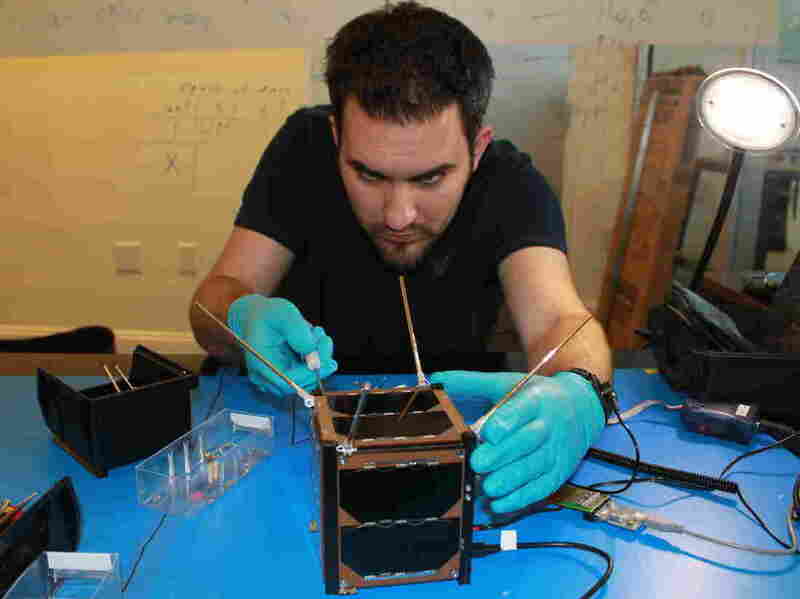 Tiny Tech Puts Satellites In Hands Of Homebrew Designers : All Tech Considered People are building everything from satellites to desk lamps with the help of the Arduino microchip. Alex Malt takes a workshop about creatively rethinking technology with HacDC, a Washington, D.C., nonprofit that brings artists and programmers together. Amy Lee Walton, Malt and Ann Vroom troubleshoot with instructor Alberto Gaitán during a HacDC workshop. Walton adjusts a microprocessor connected to a computer using code with an Arduino prototyping board, seen at right. Gaitán looks at code to command an Arduino microcontroller with Robin Bell during the HacDC workshop. Emelie Rutherford watches a presentation about Arduino microcontrollers before putting what she learns into action. Two satellites set for launch Sunday will soon be in the hands of ordinary people because they run on a tiny microchip that anyone can program. The chip, known as Arduino, is cheap and easy to use. It is already popular among designers and artists, and it's increasingly gaining ground with everyday geeks seeking to insert a little technology into their lives. In addition to the satellites, Arduino processors now control homemade robots, desk lamps and air quality monitors. As part of an experiment, an NPR digital media staffer used it to track trips to the communal candy bowl. "It's growing. 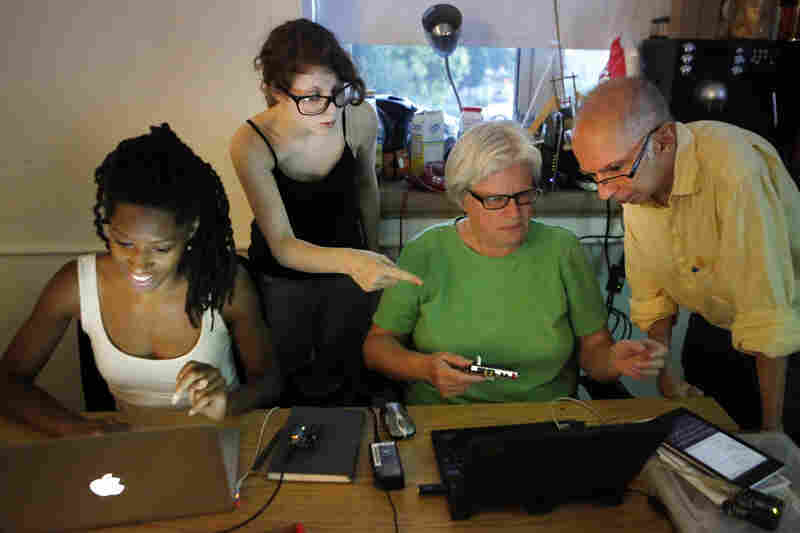 It's growing fast," Alberto Gaitán, a Washington, D.C.-based artist, says of Arduino's popularity. On a recent Tuesday evening, Gaitán led a course taught by HacDC, a local nonprofit that brings together artists and programmers. Sitting around tables are about a dozen people from all sorts of different backgrounds: lawyers, artists — even a trained philosopher. Each has his own reason for being here: Quoctrung Bui, a research analyst, is thinking about making a present for his sister. Artist Joyce Yu-Jean Lee wants to use Arduino in her next video art instillation. 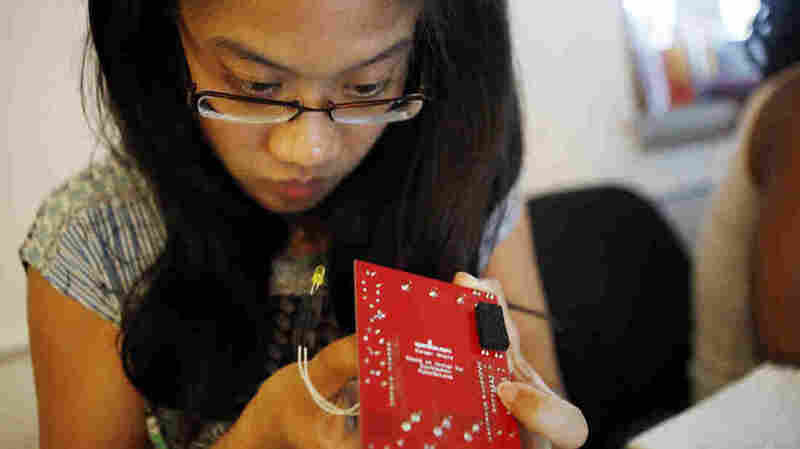 Joyce Yu-Jean Lee, 33, concentrates on a yellow blinking light during a microprocessor workshop with HacDC. 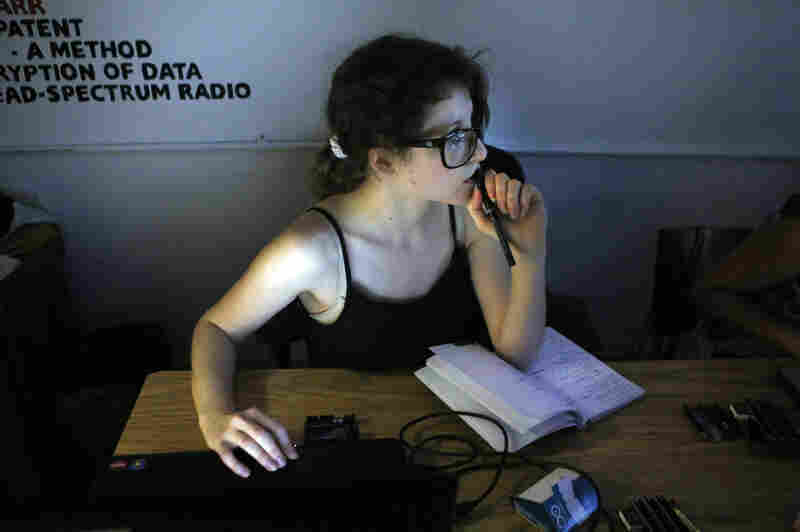 "I've been wanting for a very long time — since graduate school — to work with sensors to make my videos interact with the viewers," she says. 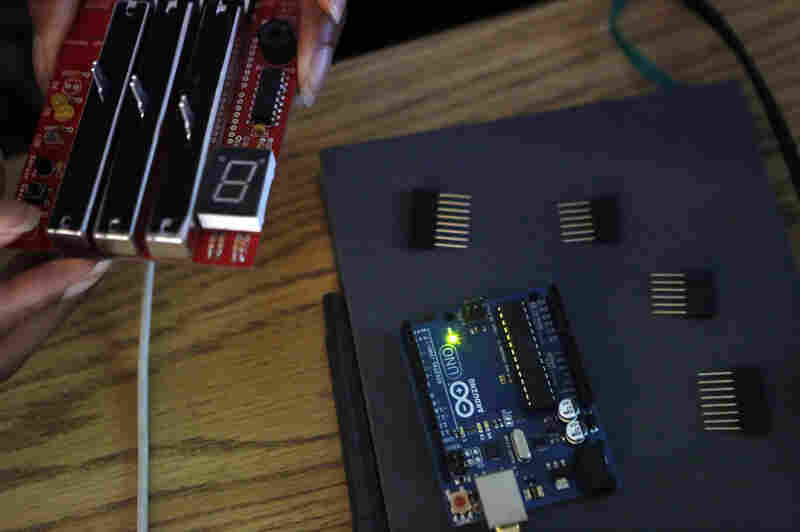 To understand why Arduino is so popular, "open up an old cellphone or something," says Amanda Williams, a product designer based in Montreal. "No one ever intended you to see the circuit board on that. If it's labeled at all it's labeled for the person assembling it just to make sure they put the right things in the right places." The Arduino, by contrast, is out in the open where anyone can play with it. It's about the size of a deck of cards and plugs into any computer's USB port. Every pin, every input and output, is labeled and documented online. It can be bought for as little as $30. And while it's not supereasy to program, it is much easier than other microchips. Back in the mid-2000s, Williams had lots of ideas for using microprocessors to make everyday objects more interesting. But the microchips available back then were expensive and hard to use. Other artists had the same problem. 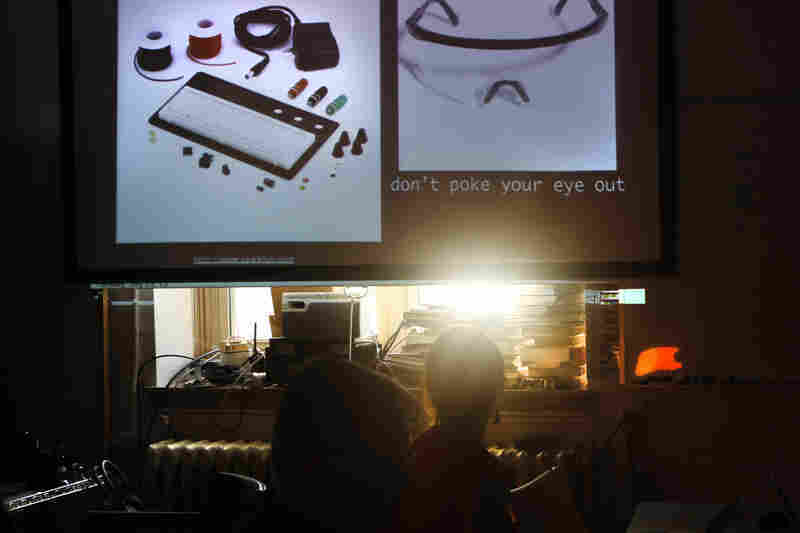 A group of instructors at the now-defunct Interaction Design Institute Ivrea in Italy noticed their students needed cheap, easy-to-program microchips for art installations and other projects. The teachers had a background in engineering, so they created Arduino in 2005. Marshall Culpepper works on satellite integration. 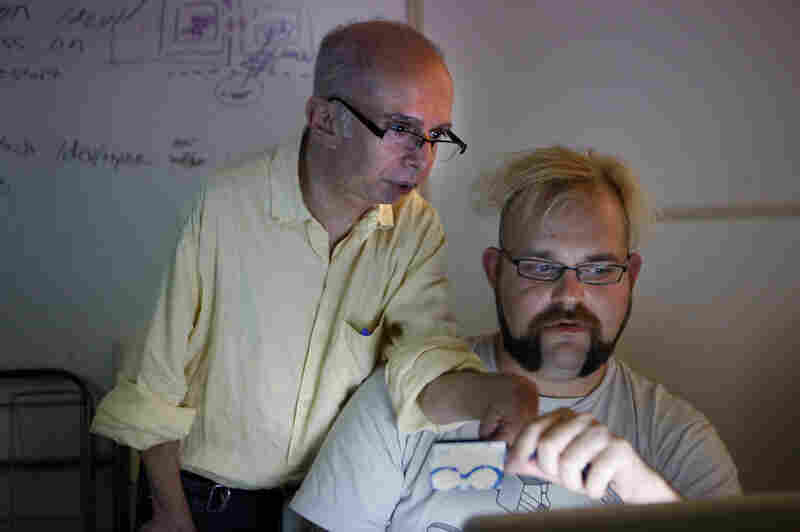 Arduino quickly caught on with designers around the world, and like many, Williams discovered it through word of mouth. "I borrowed or possibly stole an Arduino board from a friend of mine and just started fiddling around with it." In May, she launched her first product through the crowdfunding site Kickstarter: a lamp that looks like a jellyfish that's powered by Arduino. It can turn the lamp on when the lights go out or make it change color when you touch it. And the people who buy it can easily program it to do even more. "So if you wanted to use your lamp to display air quality data or if you wanted it to play a lullaby when you turn off the lights, those are all things that our customers can do," Williams says. Putting customers in control is exactly why the Arduino has ended up in satellites. The satellites about to be launched have been built by Nanosatisfi, a San Francisco-based startup that wants to put space at the fingertips of everyday people. For a few hundred bucks, artists, students or anyone can rent one of the company's satellites for a few days and program it to take pictures or broadcast a message — whatever they want. Given the populist goals of the project, Arduino technology was the way to go: "I've really wanted to use something that everyone across the world can use, that has wide appeal to everyday people," says Peter Platzer, the CEO of Nanosatisfi. "There really was no alternative." The basics of Arduino seem to come easily to the students back at the HacDC workshop. Artist Lee claps with delight as a simple program causes a little yellow light to blink on her board. It's small step toward her eventual goal of using Arduino in her video projection exhibits. "I'll have a solo show in the fall," says Lee, who doesn't have any programming experience. "I think I can get it down by then."